Hoping to hear that synagogue was a source of comfort and community at an otherwise lonely time, I was sad to hear that she’d stopped going. It was too hard to be there alone, and with a broken heart. I wondered in that moment: How true is this for others? And how is it that a religion that, to me, is a direct response to human suffering has come to be a place of unproductive dissonance for those who need it most, or at least this one who I cared about so much in this moment? Surprisingly, one answer came to me in yoga class weeks later. I was a yoga newbie. My inner perfectionist was already nervous about getting things right. Could I abide theminhag hamaqom(Hebrew for ‘local custom’) of what was clearly an established class community? Would I feel the right things in my body? Sure, I had all the outward appearances of someone who knew what she was doing. Yoga mat, check. Some spiffy leggings, check. But the truth was that I was physically out of shape and intimidated. During one of the initial poses, the teacher instructed us, “This is your space, and your time, make modifications if you need. Notice any tension in your body. Work with it.” There was no longer a right way to for me to experience the class. Any dissonance I might encounter could now be my friend. My inner tension was part of the experience, not a deterrent to it. My teacher made me feel less alone, because she made this statement to everyone, acknowledging that it would be expected that each of us might need something different out of this space, and that we might feel discomfort in our bodies. As we ask congregants to rise for certain prayers, rabbis sometimes say, “Stand if you are able”.” When we do this, we allow those with physical needs that keep them seated to be a part of our prayers. What does it look like to apply that same principle to those experiencing particular spiritual or emotional needs? That could keep them ‘seated’ on the sidelines of our otherwise joyous and decorous worship? I was fortunate enough to intern this past year at Temple Sholom. Sholom is a place of spiritual inclusivity, where the congregants and the spiritual leader are not afraid to notice the tension and work with it. At the beginning of Friday evening services, the congregation is invited to share the best part of the week. Only a short time later, before the prayer requesting a shelter of peace, Rabbi Miriam Terlinchamp invites the opposite. All those with cares to unburden, struggles or challenges in their hearts that cannot easily be dislodged, are invited to name them in the group. Even when there is silence in this moment, there is an acknowledgement that the sanctuary is a space where we can work with the dissonance, the tension, and the disharmony of our lives. We can share it with others without fear of disrupting their flow. It is part of the experience, and we are not alone. After the kaddish yatom, the memorial prayer for our ancestors and loved ones who have died, we sing verses from the book of Job, a tale of profound suffering, of one man confounded by it all and struggling to make sense of it despite his piety. It is an integral part of our canon, just as the experiences of those in our communities living with grief, mental illness, disappointment in relationships, or jobs lost, should be included in our experiences as a community. 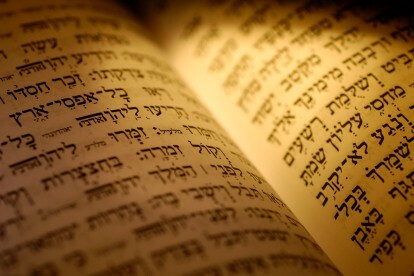 Oseh shalom bimromav (Job 25:2), hu ya’aseh shalom aleinu ve’al kol yisrael,we pray. “May the one who makes peace in the heavens above bring peace to us and all Israel.” It may be important how we define “peace.” The peace for which we pray may ultimately be relief from all our pain and comfort for all our fears. But the peace that we can actually create in our sacred spaces is a place where we can bring all of ourselves, the comfort and the discomfort, the joy and the pain. Where we can notice the tension and work with it. Rachel Gross-Prinz is a fifth-year rabbinical student and the current rabbinic intern at Isaac M. Wise Temple. She served previously at Temple Sholom in Cincinnati, Ohio.